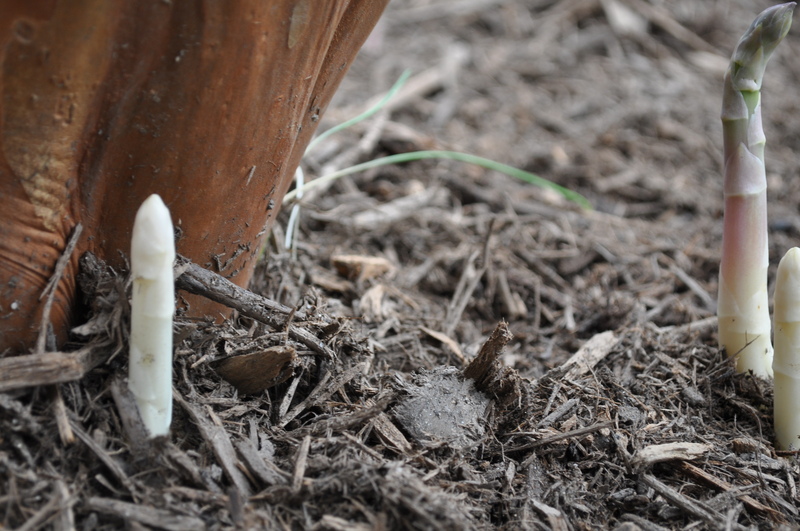 White Asparagus. What comes up deep under the mulch if you don’t move it out of the way. Wild asparagus grows many places in this area. The best way to find out is to look for the plants that aren’t harvested and that become small trees. This is how we found ours. At the base of one of the crepe myrtles there are thin wispy fronds that have fallen over. They are what sprouts from the crown if you don’t harvest the plant. You can find them if you really look carefully. We found ours while mulching one year. It seems this plant was some sort of volunteer that comingles with the base of the crepe myrtle. Today I went out looking and first saw this. If you look very closely, you can find one spear in the upper left, and one in the lower right. 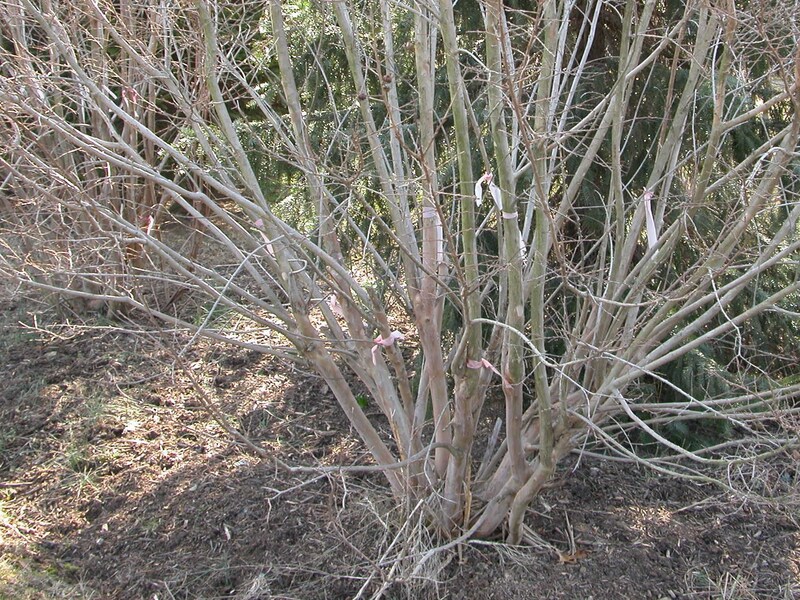 We had lots of mulch built up around the crepe myrtle this spring so the rest of the spears were fully covered. 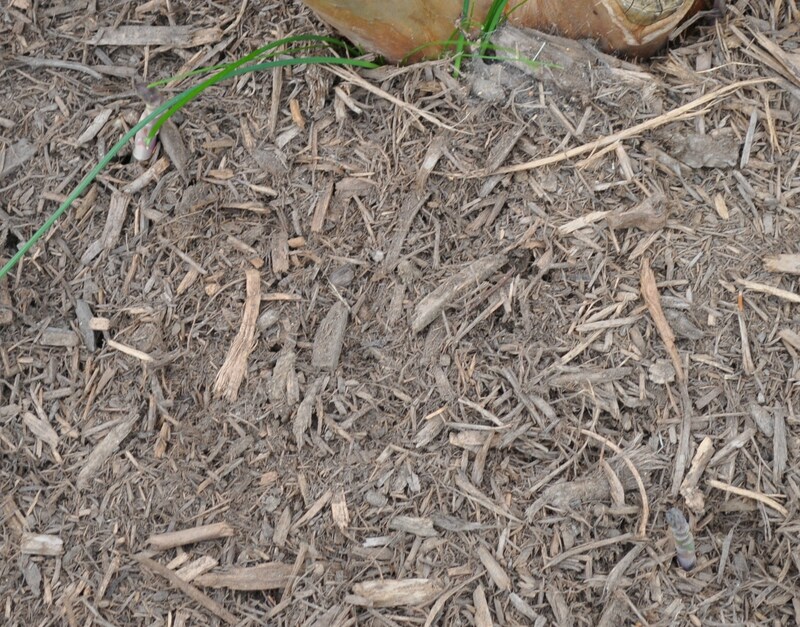 Careful moving of the mulch revealed the rest. Then I started uncovering the white ones. White because of lack of exposure to sunlight. I also found this one hidden on the other side of the bush. Now there are five spears coming up in total. 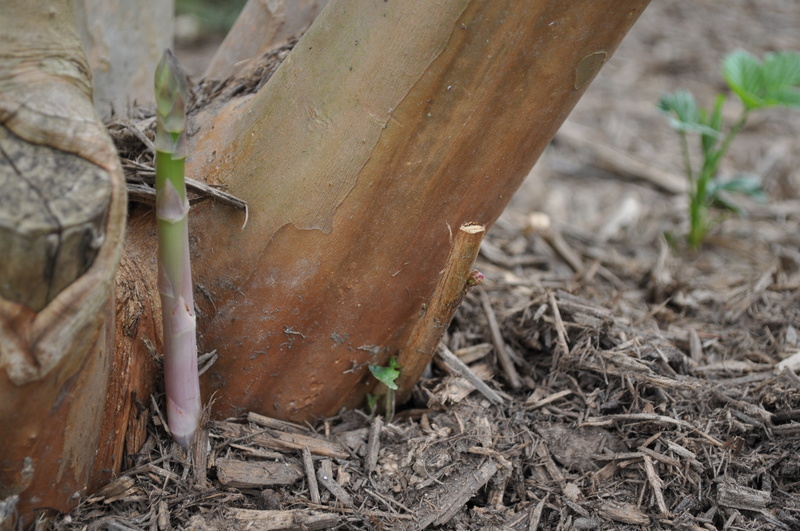 Hopefully in two or three days, I will have enough to cut and make pancetta wrapped grilled asparagus. Foraged food. Right out of the backyard. Do a little looking around in parks and on roadways in the area. 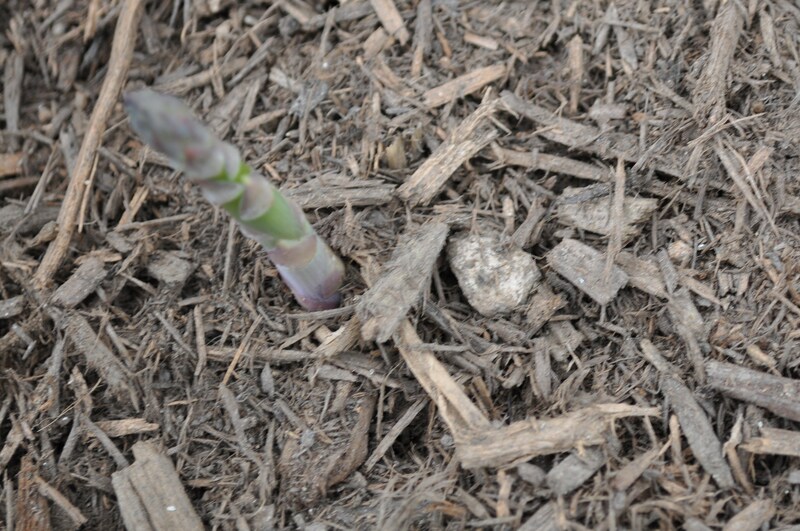 See if you can find a source of asparagus. Don’t tell anyone you found it. Just harvest and enjoy. Posted in Food, Foraging, Gardening, Howard County, Locavore, Nature, Real Food and tagged crock pot cooking, Food, foodie, gardening, hoco loco, Howard County, nature, real food. Bookmark the permalink. Love it! 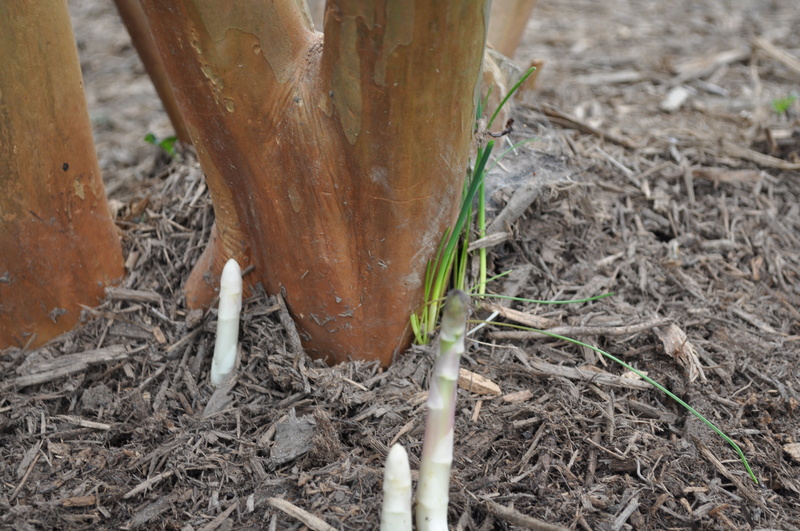 We have several crowns of purple asparagus that we planted three years ago when we first moved to our current home, but I suspect there is a lot of wild asparagus in our woods our near our pond. I just keep forgetting to go looking for it. That is so cool. I love the top photo too!